LOS ANGELES/WASHINGTON, Nov. 7 (Yonhap) -- Young Kim appeared certain to be elected to the U.S. House of Representatives on Wednesday, becoming the first Korean-American woman to serve in Congress. The 56-year-old Republican garnered 51.3 percent of the vote against 48.7 percent by Democrat Gil Cisneros in California's 39th district, according to separate tallies by CNN and the Associated Press. If finalized, she will succeed outgoing Rep. Ed Royce (R-CA), chairman of the House Foreign Affairs Committee. 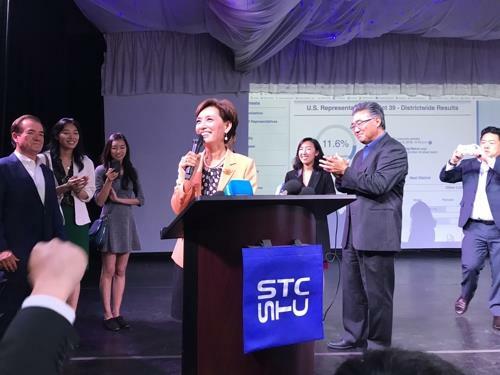 "I thank everyone who supported me and all the volunteers," Kim said at an election night watching event in Rowland Heights, just after her election appeared certain. "This was possible thanks to the Korean community's support." She gave credit to Royce for helping her "more than 100 percent" and pledged to work hard as a bridge between South Korea and the U.S. 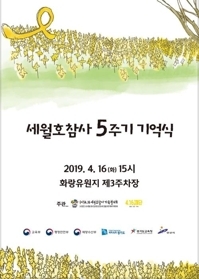 But she also noted that she wasn't elected just for the Korean community and may not be able to serve only their interests. "Only when I succeed in mainstream society can I return the favor (to the Korean community)," she said. "Because I am Korean, I will make sure to return more than you expect." In addition to working to improve bilateral relations, Kim said she will work to resolve issues impacting the local Korean community, including trade, immigration, reunions with family members in North Korea, and campaigning for Korean women who were forced into sexual slavery for Japanese soldiers during World War II. The only other Korean-American to serve in Congress was Jay Kim, a Republican who represented California's 41st district from 1993 to 1999. Young Kim worked for Royce for two decades, first when he was a state senator and then in Congress. Her last role was as director of community operations and Asian affairs. She herself was elected to the California legislature in 2014. After immigrating to the U.S. territory of Guam in 1975, Kim moved to Hawaii and then to California, where she attended the University of Southern California. She later ran several businesses. Her congressional district, which includes parts of Los Angeles, Orange and San Bernardino counties, is two-thirds Asian and Latino. Despite being traditionally Republican, the district was won by former Secretary of State Hillary Clinton, a Democrat, in the 2016 presidential race. Kim has distanced herself from some of President Donald Trump's policies, including his hard-line stance against immigration.